"Scientology conflicts nowhere with the truth and will be found to agree with known facts in whatever field it overlaps." Scientology, according to L. Ron Hubbard, is "the science of certainty". What Is Scientology? (1978 ed.) declares that it is precisely defined, the product of decades of scientific research; it achieves its results through "invariable instrumental means"; in the process, revolutionary discoveries have been made, such as the isolation of "the life unit that perceives and generates energy, a discovery comparable to the isolation of the nucleus in atomic physics." In short, it is "not only the first body of knowledge in which the precision of science is applied to the humanities, but in which it is applied to the nature and behavior of the human spirit and its potential." I have been engaged in basic research into life and the humanities ... the research has been done from the viewpoint of scientific methodology in which I have been trained. The data of Scientology was derived by and stands up to scientific methodology. It contains a workable system regarding life. It has not yet begun to be applied broadly to any of the fields where the humanities are losing out. It probably has good application in biology. It can shed, possibly, some small light in physics and chemistry. This sounds pretty impressive. Unfortunately, the scientific veracity of Scientology falls apart under even modest scrutiny. Most noteworthy are Hubbard's views on atomic radiation, which betray what an eminent Australian radiologist described as "complete and utter ignorance of physics, nuclear science and medicine" [Anderson Report, chapter 7]. "In All About Radiation, we have the sane and sober views of a medical doctor on the physical facts and consequences of the actual atomic blast and the diseases resulting from it. L. Ron Hubbard, who was one of the first nuclear physicists in the United States, has interpreted these facts and related them to human livingness, governments and the control of populaces. These facts when presented at the Congress on Nuclear Radiation and Health at the Royal Empire Society Hall, London, in April 1957, so impressed Parliamentary figures that they requested immediate transcription of these lectures." 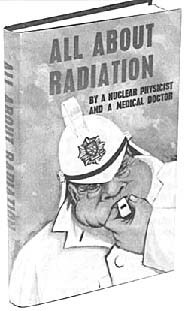 The cover of the 1957 edition (above) proclaims it to have been written by "a Nuclear Physicist and a Medical Doctor". The medical doctor writes pseudonymously as "Medicus", but the Library of Congress listing for that edition gives his real name as Richard Farley. The latest edition, published in 1989, gives his name as Dr. Farley R. Spink, allegedly of the University of Cambridge, England. Jon Atack suggests that Farley/Spink is actually a Hubbard pseudonym [Atack, A Piece of Blue Sky, 1992, p. 142]. However, the section of the book written by Farley/Spink, "The Facts about the Atomic Bomb", is reasonably accurate in terms of scientific veracity and is written in a very different style to Hubbard's usual bombastic tone. It concludes with a declaration of support for some of Hubbard's ideas on vitamin treatments but has few stylistic similarities with known works by Hubbard. It is most likely, therefore, to have been written by a medically aware Scientologist. The 1989 edition also contains a introduction from Dr. Gene Denk, which is likewise reasonably scientifically accurate. The good doctor is described as "having participated in independent scientific studies of L. Ron Hubbard's Purification [anti-toxin] program". What is not stated, however, is that he was L. Ron Hubbard's personal physician for at least 10 years and a Scientologist for at least as long; the "independence" of his studies is therefore very questionable. The second part, "Man's Inhumanity to Man," is essentially a transcript of the lectures Radiation and the Scientologist (renamed "The Real Threat of Atomic Radiation" in the book), Radiation and War, Radiation and Scientology and The Control of Hysteria (aka "Man's Real Enemies") - all part of the "Radiation and Your Survival" series and all given on 13-15 April 1957. It also includes a section on the "Purification Program" taken from bulletins issued in the 1970s. PLEASE INFORM DR HOUGH PHD VERY ACCEPTABLE. PRIVATELY TO YOU. FOR GOSH SAKES EXPEDITE. WORK HERE UTTERLY DEPENDENT ON IT. CABLE REPLY. RON"
"having reviewed the damage being done in our society with nuclear physics and psychiatry by persons calling themselves "Doctor" [I] do hereby resign in protest my university degree as a Doctor of philosophy (Ph. D.), anticipating an early public outcry against anyone called Doctor; and although not in any way connected with the bombs of "psychiatric treatment" or treatment of the sick, and interested only and always in philosophy and the total freedom of the human spirit I wish no association of any kind with these persons and do so publicly declare, and request my friends and the public not to refer to me in any way with this title." "I don't know who promoted the book or who wrote the promotion for the book. I presume the organization did, but in that my husband -- in lots of lectures that he gave [he] would laugh and talk about the course of nuclear physics and how he had one theory about them and his professor had another theory, and I know that he was not in his lectures holding himself out to be a nuclear physicist. So I don't know who, you know, on the printed jacket -- and I really don't, if you say like do the personal matters have -- I don't think many Scientologists consider those -- his personal background or whether he went to this or whether he did that of any significance at all. "is founded on the work of one man, L. Ron Hubbard, engineer, explorer, nuclear physicist and writer." "... because I was educated in the field of atomic physics - which doesn't mean a thing, by the way ... I wasn't really supposed to be there, I was a writer, and I had to go to school just like anybody else. They said that was what I was taking and so I obediently sat there and took it, but not very deeply... It was very hard for a young man like myself to absorb it." "Nearly all nuclear physicists - atomic and molecular phenomena boys - 'Buck Rogers Boys', we were known as ... Like so many physicists I wrote science fiction for years, and that was the only remunerative use I made of this material." "I got the worst grades [on the course]. Only one person got worse grades than I, and he didn't take the course!" "Evidently not much is known at this time concerning radiation, its testing and the immediate results of radiation on the health of Earth ... From the intelligence tests which exist and from the professional ratings and so forth of the individuals in Scientology, you're actually dealing with the upper strata of the intelligentsia of the world ... Scientologists represent the upper bracket. And if we don't know anything about radiation as a body, if we in general, as Scientologists, are not informed on this subject, then don't think that somebody down here in the Chancellor of the Exchequer's office knows anything about it. Don't think the Ambassador to Ceylon [now Sri Lanka] knows anything about it. We're up against something very appalling here!" Precisely why the officials of the British finance ministry should be experts on radiation is unclear. But by this time, the effects of atomic radiation were very well known; atmospheric nuclear testing had just been suspended, after it was discovered that more than 1,000 atmospheric tests by the USA and the USSR had increased worldwide background radiation levels significantly in only 10 years. The unfortunate inhabitants of Hiroshima and Nagasaki had found themselves the subject of intensive research by American scientists into the long-term effects of radiation exposure. The High Commands of both the USA and the USSR had also investigated the effects of radiation exposure by the simple, if brutal, method of detonating atomic bombs next to troop formations (above). Valuable data was gathered; however, thousands of soldiers eventually died of radiation-induced cancer. Such efforts were undertaken because it was thought that a nuclear war was imminent. 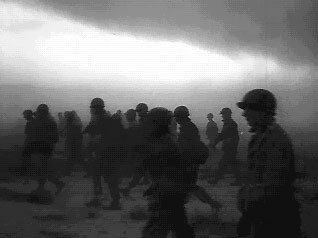 Any way of protecting or proofing vulnerable human bodies against radioactive fallout would have been of huge significance in enabling troops to survive this deadliest of weapons. But no defence was found; the USA and the Soviet Union soon realised that a nuclear war would mean the extermination of both countries. From this developed the doctrine of Mutually Assured Destruction - appropriately shortened to MAD - which many today credit with having dissuaded aggressive politicians on both sides from "pressing the button". "I don't care what their theories are. They will tie themselves down with these theories and change them every month - there's nobody quite so adrift as somebody in one of these atomic energy projects ... Those who are engaged in studying [nuclear physics] are, I have to say - very few of them have been trained thoroughly in atomic and molecular phenomena. You see, there aren't very many people trained in atomic and molecular phenomena - there were only in the neighborhood of three or four hundred of them in 1933." He was at least honest enough to admit that "very few, if any, including me, know anything about it." "a particle which emanates from an explosion, or a particle which emanates from radium from uranium ... if it is a big explosion, you get lots of particles emanating which go right on emanating. When you have a small deposit of uranium, you have particles emanating of course, but you have to be close to it and they have a tendency to die down." "Radiation is either a particle or wavelength - these things become the fad or fashion .... One moment everybody says it is a wavelength and the next they say it is a particle. This has been going on since 1932." 1932, coincidentally (? ), was the year in which Hubbard dropped out of George Washington University and ended his involvement with the academic world. In fact, atomic radiation is a mixture of radiated particles (such as alpha rays - charged nuclei - and beta rays - electrons) and electromagnetic radiation - gamma rays, ultraviolet rays, infrared rays, microwave radiation and, of course, visible light. The duration of radiation emission is precisely the reverse of Hubbard's claim: it is quite safe to visit the site where the first atomic bomb was exploded in 1945, but you would not want to spend any time near a nuclear reactor's unprotected core even in 10,000 years' time. What he may have been trying to say - but was frustrated by his lack of knowledge - was that atomic explosions produce much more high-energy, deeply penetrating radiation, chiefly in the form of electromagnetic rays. "Today we throw a few rays at somebody and tomorrow we throw a few rays at the same man ... and all of a sudden he dies - as though he had been shot with a bullet. In other words, the effect of radiation is cumulative ... With gamma ... you get 300 Roentgen and then you get another 300 Roentgen and it doesn't matter if they're a year apart or three days apart - they add!" Hubbard was evidently unaware of the large amount of medical evidence suggesting the opposite. It was well-known (from studies of the Hiroshima and Nagasaki survivors) that the biological effects of a large dose of radiation delivered rapidly differ greatly from those of the same dose delivered slowly. Protracted exposure is better tolerated because some of the damage is repaired while the exposure continues, even if the total dose is relatively high. A good current example of this is the people (who now number several thousand) who have moved back into the so-called "death zone" around the Chernobyl nuclear plant in Ukraine; although they are exposed to a constant medium to high level of radiation, the ill-effects are muted by the duration of their exposure. An equal dose received in a few hours or minutes would be lethal. However, Hubbard does not appear to have realised that gamma rays do not consist of particles, and he alludes to "gamma" drifting around in the atmosphere for long periods. As gamma rays travel at the speed of light, they would not "drift" for very long! "You know, [radiation] kills the human body very, very dead, but it'll go through a sixteen foot wall! A gamma ray'll go through a wall, very easily. How does this hurt the body? Nobody can tell you. A wall can't stop a gamma ray, but a body can. And we get down to our number one medical question. Gamma rays go through walls but don't go through bodies ... I can tell you, fortunately, what is happening here. Resistance! The wall doesn't resist and the body does. The gamma ray does not really settle in the body. It goes on through, but its passage creates some kind of sensation which, if too recurrent, is resisted on the part of the cells of the body." This particular assertion - that radiation goes through 16-foot walls but not human bodies - is tendentious, even for Hubbard. The diagram above shows the true extent of the penetration of matter by different types of radiation. The radiologist who gave evidence to the 1965 Board of Inquiry into Scientology in Victoria, Australia, declared that Hubbard's claim was "a complete denial of physical truths and was a basic scientific fallacy which would lead to disastrous consequences in this community at this time if it were not resisted ... such a statement shows complete and utter ignorance of physics, nuclear science and medicine." It is hard not to agree with the radiologist's verdict. What did Hubbard consider the purpose of a 16-foot concrete wall around a nuclear reactor, if it was not to shield against radiation? Remarkably, despite the extreme absurdity of this statement, it continues to be propagated even in the latest editions of All About Radiation. "The bomb goes off in Australia, and a 360-degree sphere of ionosphere (which is up there not too far above your heads, not too many miles) flashes. In other words, the flash in Australia, the ionosphere flashes. People get a secondary kickback from the ionosphere just as though they were standing next to the bomb, don't you see?" So you could say maybe a bomb burst down there in Australia and you get a momentary flash over the entirety of [the] Earth, don't you see? Something like that could act as a conductor. This has not been studied." Needless to say, Hubbard's "discovery" has not been studied since then. "Now, all America sits in front of television sets and those television sets exude, I am sorry to say, a considerable amount of radioactive material. It's not huge, you know, but it's enough so that people who have made a habit of watching TV ... get the TV radiation." "In my basic physics textbooks, to show you how opinions have changed, when I was at modern high school, they used to teach that the sun was combusting on hydrogen. There was an inexhaustible supply of hydrogen and they calculated the length of life of the sun on hydrogen, and this was very, very nice but it didn't work. Because if its length of life was calculated on hydrogen, then you would get a difference in the heat of the sun from day to day because it was burning out. This didn't happen, so the theory was eventually abandoned and people finally owned up and said that they didn't know why the sun kept on burning. It was only when nuclear physics became dominant in men's thinking that they've explained sunlight, and sunlight is occasioned by a continuous fission going on, on a sphere called the sun." "The sun happens to be fission. That is why the sun keeps lighted. It's a fission item. And if it's a fission item, then we're going to get some byproducts of fission as that, and that does cause sunburn." No less than four reiterations of the sun being fission-powered! Nuclear fusion was not some strange, exotic new theory in 1957. The first fusion reactions on Earth had taken place as early as the 1930s in the first cyclotrons, invented by the American physicist Ernest Lawrence. Had Hubbard looked in an encyclopedia he would have found this out (though shouldn't he have known this as a "Buck Rogers Boy"?). So the alteration of the transcript of Radiation and Scientology is clearly an instance of the Church, embarrassed by Hubbard's ignorance, covering it up for him. He, notoriously, was very sloppy about correcting his factual mistakes: witness the allusions to the non-existent Piltdown Man in A History Of Man, which remained unaltered even after the Piltdown hoax was exposed. "There's all kinds of interesting bric-a-brac about [radiation] - that by the time you take uranium and refine it, you get an intolerant element known as plutonium. And if you have too much plutonium it goes boom, and the gamma goes flying all round, other elements are influenced and so forth. It is an intolerant element. It is artificially manufactured and is very intolerant of itself. The way you make an atomic bomb is very interesting ... You take a piece of plutonium here and a piece of plutonium there and you put a stick between them, you see. You fix the back piece of plutonium so that it'll slide up and hit the front piece of plutonium when the stick hits something, and then you simply throw the stick. When the front piece of plutonium hits the ground, the back piece of plutonium hits the front piece of plutonium and it goes. And that's a bomb. And when it goes it releases a tremendous amount of gamma and many other items much too lengthy to catalogue." Hubbard appears to have had in mind the gun-type atomic bomb (as used at Hiroshima). The diagram above shows how this works. (It uses uranium, not plutonium). A small wedge of uranium is fired at a larger, target piece; upon impact, a critical mass is formed and the uranium fissions. A massive amount of energy - up to the equivalent of several tens of thousands of tons of TNT - is released. Bombs of this type are still in service, though in modern designs the case is itself made out of uranium to lighten the weight of the weapon. 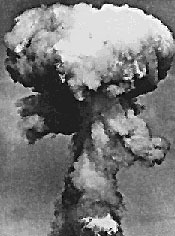 The other type of fission bomb (used at Nagasaki) uses a sphere of explosives around a piece of uranium or, more usually, plutonium, to implode the fissile material to a critical mass and so initiate a chain reaction. Needless to say, neither design uses "sticks" which are "thrown". "[Plutonium] makes other things explode. So that plutonium can be put inside other elements [sic] and you get such things as fusion. It's simply an atomic bomb. The H-bomb - I don't know why they've suddenly started calling it an H-bomb - basically they're just another set of elements triggered by the original explosion of plutonium ... it takes a few pennyweights [of plutonium], that's all." Perhaps people called it an H-bomb because it exploded hydrogen isotopes? Fusion bombs - at least, those in service in the 1950s - rely on a large fission bomb to trigger fusion of deuterium and tritium (the aforementioned isotopes of hydrogen). The resultant explosion is equivalent to up to 50 million tons of TNT. The fallout thus produced is considerable - apart from the residue of the original fission bomb, the case of 1950s fusion bombs was made of uranium to cause further secondary fission explosions, thus increasing the overall power of the bomb. Needless to say, the device contains more than a few "pennyweights" (ounces?) of fissile material; many pounds would be more accurate. "Well now, strontium-90 may or may not do anything except inform the bone cells, "This is the end of track, brother, because someone has invented and is using radiation on this planet." Extent of message to the body, then: "Radiation has been invented. It does exist. This is the end of the genetic line. Get off the streetcar, or continue in some wild and peculiar form that we will experiment with in order to go on, which is impossible." Now, that's what cancer is all about. It isn't a strange sickness. It is the effort on the part of a few cells not to surrender, and to go off and make a pattern of their own in any way, shape or form they can... Second-dynamic mutations, births of peculiar animals instead of babies is, of course, merely the total effect of the body itself to create something that can survive in spite of radiation. And that is evidently what mutation is about, and that is all it is about." Quite how one could "invent" radiation - a natural phenomenon - is not explained. Who "invented" solar radiation, for instance? "The genetic aspects of radiation ... are the least important. This is of no consequence." It always requires a second-dynamic or sexual upset, such as the loss of children or some other mechanism to bring about a condition known as cancer. This is cancer at the outset. I have examined too many cases not to have recognized this, because it is present in every single case that had cancer that I've ever examined - real wild curve on the second dynamic. And where we have helped a case with cancer we have processed such things as wasting babies and accepting babies, and mocking up babies and throwing them away, and doing suchlike and so on, and we have had a considerable change in the condition of the case. However, a person can get so far gone that he can hardly be processed or not processed at all, and when this is the case, why, the cancer gets him." Sadly, "baby processing" has occasionally been used in preference to medical treatment by Scientologists with cancer. The Australian Anderson Report highlighted a case in 1959-60 where a Scientologist was audited for 200 hours to remove a stomach cancer, using commands such as, "What stomach could you confront? ", "What stomach would you rather not confront? ", "Think of a stomach you could confront, think of a stomach you would rather not confront", "What part of a stomach could you be responsible for?" Needless to say, he died within a few weeks of beginning his course. Hubbard nonetheless persevered with his efforts to address the problems of radiation exposure. Scientology, it emerged, provided the only sure way of curing the ill-effects of radiation exposure. "We can take a burn which would be fatal within about 40 days and cure it. Standard, routine processing does that. A burn that would ordinarily result in death in 40 days. This I know we can do. 20 days, I don't think we can do at this time. That is, a burn which will result in death in 20 days, we cannot do. Not yet!" "Alcohol was a tremendous thing, but here's an oddity. Today, alcohol makes people feel tired. Now, isn't that an oddity? It's been laid in on the genetic line, evidently to such a degree that it now produces the illness it was most used as a remedy for. Any time you got tired, you took a drink. The genetic line ... accumulates these things ... The experience the body line has in one generation may culminate in another generation. Even so, Darwin found out that when you took horses up to the high country in the Middle East, they would then grow long hair after a season or two. But when you took them - these long-haired horses - back into the low, hot country, they wouldn't get rid of the long hair, just in case, for about four generations." This is deeply ironic: Hubbard is here following not the ideas of Darwin (whom he derided as the originator of the "Man from Mud" [sic] theory) but of Trofim Lysenko, the Soviet biologist and crony of Stalin whose bogus theories retarded Soviet biology for decades. Lysenko believed that characteristics acquired by one generation of organisms would be passed on to subsequent generations. Wheat plants raised in the right environment, for instance, would produce seeds of rye - which is equivalent to saying that dogs raised in the right environment would produce fox cubs. Unfortunately, such absurd ideas became state dogma between approximately 1935 and 1965. Darwinian biologists were sent to the gulag or were executed for "bourgeois Darwinism"; Lysenkoite pseudoscience ruled the roost. There is thus a double irony in Hubbard's use of Lysenkoism. One pseudoscientist is unwittingly citing another, and the rabidly anti-communist Hubbard is unknowingly favouring Stalin's favourite biologist. "Radiation might have been used [at some past time] as a cure. And using this principle that eventually the cure becomes the disease, and eventually restimulates the disease it was supposed to cure, I'm sure that somewhere on the genetic line radiation was used for a bad stomach, for a bad skin - get the idea? And sure enough, it was, and is, today ... We have also had X-ray [sic]. X-ray, oddly enough, has been used for cure for cancer ... A cure for cancer? That's very interesting - it must have been in vogue for some time for the excellent reason that X-ray causes cancer." "[A person] considers radiation ... as something of a worry. And when a person is at a level where his general physical health is good, then this worry is not capable of depressing him into ill-health ... A person who is in excellent physical condition does not particularly suffer from the effects of radiation." "I do believe that [atomic fission] will continue to be tested to a point where everybody is so pronouncedly ill that a great deal of the ability will be gone out of this society." "the greatest danger of radiation is not small, invisible particles drifting through the air, but the hysteria which is occasioned by the propaganda, the misunderstanding and threat which accompanies it. That hysteria is the threat, not the particles." The current addition of All About Radiation has recast this as merely the first danger. "We already have data of sufficient importance and figures of sufficient reliability to demonstrate that the Scientologist, by processing and by processing of others, can very easily nullify such a minor thing as a [radioactively] polluted atmosphere." The 1989 edition of All About Radiation adds after "a polluted atmosphere" the words: "as many of these dangers are of a mental and spiritual nature." Maybe so. But Hubbard, in his lectures on radiation, addresses specifically and primarily the physical effects of radiation; he does not qualify his words as All About Radiation purports to show. "None of this, however, nullifies the actual physical danger of radiation which does bring about a physical deterioration." And yet, in the very next section of both the book and (more strongly in) the tape, Hubbard explains that in certain circumstances, radiation does not cause harm. It is apparently being used as a "control mechanism" to tell people that they "are not supposed to have war with and are to obey countries that do not have radiation". (As Hubbard has so far, in the tape, been talking primarily about people suffering from sunburn, this statement is rather confusing: does the sun never shine on "countries that do not have radiation"?) But people naturally resist radiation being used to control people - not that Hubbard ever explains how it is used this way. As a result, "when radiation is used as a control method, they resist it and it burns them - and only then does it burn them" (my underlining). In other words, if they do not resist it, it does not and cannot harm them. They must therefore be processed into offering no resistance to radiation, by learning how to "confront" it. The other method of dealing with the ill-effects of radiation would be through the use of "several preparations which prevent radiation" [sic]. One particular "chemical assist"
"seem[s] to do rather fantastic things which open up future research areas in the direction that Man can overcome [radiation] biochemically ... That stuff is Dianazene ... We have this factor of a biochemical assist which is pretty good, offers a great deal of promise, and we have ... to a marked degree, overwhelmed this beast called nuclear physics and radiation. A few people, such as ourselves, the only group on earth that have made any progress in this direction at all, to actually harness and muzzle the amount of destructiveness which exists in the atmosphere of Earth today." "a haphazard mixture of vitamins and glutamic acid, which was taken in huge doses in the belief that it made the patient "run [i.e. audit] better". There were no adequate controls set up for this experiment and it was a dismal, expensive failure." This evidently did not deter Hubbard from reviving its use in Scientology. Intriguingly, although Hubbard states that he is only "reporting the results of experiments... not advising you to do anything here" - a disclaimer reiterated on the "Radiation and Your Survival" box - GUK is still produced and is still sold in Scientology establishments. What is it used for? "there is an incorrect entry in both the British and American pharmacopeias. It says that nicotinic acid ... turns on a flush, and an overdose is therefore toxic. This is not correct ... it turns on the conditions brought about by atomic radiation." All About Radiation (1989 ed.) adds in a footnote that "the flush is caused by the fact that sunburn is radiation is being run out [purged]". A major proof of this, according to Hubbard, is that the niacin flush appears in the exact same pattern as sunburns, for instance matching the areas left uncovered by bathing suits. Anecdotal reports from those who have taken Dianazene suggest that this may actually be the case. But there is no medical evidence that radiation is stored and accumulated in the body, as Hubbard supposes. Is it not more likely that the extent of the flush's visibility is influenced by the differences in skin pigmentation produced by uneven tanning? Oddly, it is never quite clear, in either book or tape, if Hubbard understands precisely what sunburn actually is. Elsewhere, he describes atomic radiation as being "X-ray" and "gamma". He describes the ill-effects which they cause. Then he says that sunburn is a result of exposure to atomic radiation. Does he mean that it is caused by gamma and X-rays? Apparently so, for in his discussions of sunburn he notably fails to mention ultraviolet radiation (the true cause) or sun cream (the most effective solution). If he is aware of UV's role, he conceals his awareness well. "The reaction to radiation in persons who have been given Scientology processing is by actual test much lower than those who have not received it. We have conducted some experiments in this direction." "However, one still has to care for the physical body and its reactions on a biochemical level." "A man who didn't have much liability to skin cancer (he only had a few moles) took Dianazene. His whole jaw turned into a raw mass of cancer [sic]. He kept taking Dianazene and it disappeared after a while. We were looking at a case of skin cancer that might have happened." There are obvious absurdities in this claim. Hubbard is clearly not talking merely about having an undiagnosed cancer. Note that in the original tape lecture, he speaks of an incipient cancer - i.e. one which has not yet occurred. He seems to be saying that cancer is a latent problem in people and that Dianazene will permanently eradicate it. It is true that some people's genetic makeup may render them more vulnerable to developing cancer, but in most cases this does not mean that they will develop it. Nor is there any objective evidence that Dianazene has any health benefits. Indeed, under English law at least (the Cancer Act 1950), it is illegal to claim to be able to cure cancer. "Somebody had a little bit of colitis, worried him a trifle from time to time, we started feeding him Dianazene and suddenly he starts bleeding from the intestines, he gets very upset, knocks him into a cocked hat, he keeps on with Dianazene and comes out the other end with exactly no colitis. What was he facing? He was facing an eventual colitis of a fatal nature - haemorrhages - so we ran it out." "a program developed to assist in releasing and flushing out of the body the accumulated toxic residues which may be lodged in the tissues, while also rebuilding the impaired tissues and cells." Radiation is apparently enormously water-soluble as well as water removable. According to researchers, one merely has to take a hose to a building surface or a road to wash the radiation off of it. This factor is well known to defense trained personnel." Hubbard evidently had learned nothing about physics or biochemistry in the twenty years since the London radiation lectures. LSD is very water-soluble and is usually flushed out of the body fairly speedily; there is no independent evidence that it lodges in the fat cells. Hubbard is even more confused in his statement on radiation: he appears to have forgotten about the difference between radioactive substances and the sub-atomic radiation which they emit. It is true that radioactive substances can be dispersed with water jets (although one then has the problem of dealing with a lot of radioactive water). It is not true, however, that radiation can be dispersed with water. A glass of water does not contain innumerable dissolved photons and infra-red rays. Electromagnetic rays would not even notice a jet of water. "All the information [on LSD] came from one person who had taken LSD once. That was how he did his research." It is more than likely that a similar lack of research lay behind his ignorance on radiation. Nonetheless, Hubbard managed to convince himself that he had made the discovery of the century. He issued a written order to his personal PR officer, authorising the expenditure of "unlimited funds" in an effort to win a Nobel Prize for himself. The infamous Guardian's Office - Scientology's then intelligence service - was ordered to investigate the Nobel Committee to determine whether any of its members could be persuaded or pressured into nominating Hubbard for a prize. The attempt failed dismally. Those who have a full and complete Purification Rundown will survive where others not so fortunate won't. And that poses the interesting probability that only Scientologists will be functioning in areas experiencing heavy fallout in an Atomic War." "Those who have a full and complete Purification Rundown could fare better than others not so fortunate. And that poses the interesting probability that only Scientologists will have had the spiritual gain that would enable them to function in areas experiencing heavy fallout in an Atomic War." "Prior to starting the Purification program, I had a history of moderately heavy radiation exposure. This consisted of long periods of sun exposure through childhood and college and frequent X-ray exposure from working around X-ray machines with patients for some seven-odd years. I had no physical problems or complaints upon starting the Purification program. My drug history had been very light. During the program I had several episodes of extreme flush, splotchy rashes accompanied by nausea and a very solid, wooden feeling. At times, there was an electrical kind of discharge from the body especially to the arms and hands. Interesting enough, after the program I realized several low-grade somatics that I previously had ignored were gone. Small things, like occasionally unexplained nausea or mild aches in the muscles and joints. Consequently some attention is freed from the body and the above somatics have not particularly reoccurred in the two years since finishing the program. From my viewpoint as a physician, this raises several questions on what effects low-grade radiation of different types over a lifetime can have on a being or his body -probably more significant than is currently recognized." "Before the program I felt "massy" around the head. I thought I was doing okay but I knew it wasn't quite right. I felt as though something needed to be handled. While doing the program l went through periods of blankness for days. I just couldn't seem to remember things. Also, I went through about one week of not being able to catch my breath. You know, I didn't even realize I had had a problem with it, but now I can recall shortness of breath while mountain climbing, but only when the weather was hot. After the program, I am in great shape. I feel sharp, alert and ready to face life. I sure do feel better about life and myself now." "It should be noted what happened one night in the sauna. After I had been in there for some three hours I turned on a tremendous amount of radiation. There was no redness with the niacin, merely the tremendous heat and pain l felt when I got a good deal of radiation from atomic blasts in 1953. I almost died from radiation burns at that time. I received a great deal of atomic radiation from drinking water that had been filled with fallout. In the sauna I experienced the full return of that moment. I felt the grief and the anger and the pain and the swelling of the face and the blisters and the pain through to the bones. I then went hack into the sauna and was able to "blow off" a good deal of this feeling by further sauna exposure. I feel I have now run out all the drugs and the extreme radiation that I was exposed to in this lifetime. I regained my affinity for people and have a greater love and tolerance for them as a result of the drugs being removed. There have been times on this program when I felt such exhilaration and felt the way l felt when 1 was a kid... My energy level has picked up tremendously. My friends that I grew up with have not been so fortunate. The atomic tests or the fallout from those tests in Nevada, falling on Utah, have done such a great deal of damage to so many lives. Some of my friends in Utah are dead as a result of those tests. My life would have gone by the boards if I had not had this program. There is a deep sense of gratitude to L. Ron Hubbard for this program." "My improvements were multi-faceted. When I began this program I had reached the point where I felt the a return to well-being was highly improbable if not impossible. During the first thirteen to fourteen day of the program I continued to believe that improvement was out of the question for me. And then WHAMO! Something miraculous happened! Damned if I didn't begin to feel better. A little better at first in subtle yet noticeable ways. For instance my stamina increased; my feelings of tiredness began to dissipate slowly and grudgingly. Towards the end of the program I realized that I had more vitality than at any time in the last seven or eight years. Emotionally I felt up. Depression lifted and I could once again feel exhilaration when such moments occurred. There is new hope for radiation victims! I'm the living proof of it!" This demonstrates that the Purification Rundown's application in the field of radiation is not merely a matter of encouraging spiritual gain, but is also intended to be a physical and psychological treatment as well. The evidence shows clearly that Hubbard made numerous basic and easily-avoidable scientific errors relating to Scientology, almost certainly as a result of conducting very little useful research before announcing his latest theory. But does it matter? It does matter, for three reasons. First, although the disclaimer on the "Radiation and your Survival" box says that "the theories explained in these lectures deal specifically with the spiritual betterment of the individual", the Church of Scientology has never admitted that Hubbard's views on radiation are fundamentally wrong. The radiation lectures are still essential study materials. At no point does Hubbard say that his theories on radiation are purely "spiritual" - he states everything as proven scientific fact, even when it patently is not. Scientologists are still taught that Hubbard is the unimpeachable "Source", a brilliant genius who could do no wrong. Likewise, the disclaimer states that "These lectures ... cannot be construed as a recommendation of medical treatment or medication, and it is not claimed to be a physical handling for individuals. The author [Hubbard] makes no medical recommendations, warranties or representations as to the theories expressed in these lectures." This is very hard to reconcile with Hubbard's claims on the effectiveness of his "chemical assists" (such as Dianazene) in proofing against radiation. Do Scientologists themselves regard Hubbard's medical claims as purely theoretical? Apparently not: Dianazene is still in use. It is made by the Scientologist-owned company G & G Foods of London Road, East Grinstead, Sussex, retails at £2 for 350mg, and is on sale in the canteen of the Hubbard College of Scientology at Saint Hill Manor, East Grinstead. GUK too is produced by the same firm and sold in the same establishment. Why does the "Radiation and Your Survival" box have the following Hubbard quote displayed prominently on its reverse? "... There is actually such a point where a person's beingness can be sufficiently great that he becomes practically indestructible." And why does the enclosed glossary contain the following definition? Dianazene: (Tape #2) a formula combined with vitamins and other minerals to make the intake of nicotinic acid more effective. Dianazene permits the body to react to radiation it has already accumulated and radiation is only dangerous because it is cumulative. If you can knock out its cumulative effect, you can laugh at it. In short, Hubbard's absurdly inaccurate views on basic physics still have currency in Scientology. The disclaimers on the "Radiation and your Survival" box appear to be nothing more than a legal smokescreen to avert unwelcome attention from the authorities. All the evidence points to Scientology continuing to claim that it can make its members immune to radiation. Second, how will a Scientologist behave with regard to radioactive hazards if he has been told that he is "proofed" against the effects of radiation? It is relatively harmless for "the Scientologist in the street" to believe that he is immune to radiation. But what if he deals with radiation in, say, a laboratory, hospital or nuclear power station? Will he comply with safety regulations or ignore them because he believes that he is not at risk? Third, Hubbard's "research" into radiation was so sloppy that he made numerous errors, in areas so fundamental that a high school student could easily spot his mistakes. He relied on his followers blindly accepting his statements, declaring that "this [information] is in the libraries, the text books, it's very common." But checking his claims against such sources shows that much of what he says on radiation is inaccurate or simply wrong. What does this say for the quality of the research which produced Scientology itself? It's unlikely that Scientology will ever address these questions. After all, if L. Ron Hubbard said it was so, it must be so - mustn't it? HCO Bulletin of 26 May 1959, "Man Who Invented Scientology"
HCO Bulletin of 3 January 1980, "The Purification Rundown and Atomic War"
diagrams showing radioactive penetration and the gun-type atomic bomb.